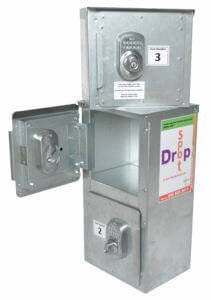 DropSpot will help you when customers need to pick up or drop off items after hours. 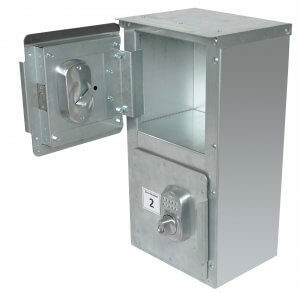 A secure storage area that is placed either inside or outside on your property with easy public access. 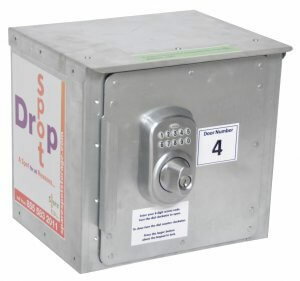 Each DropSpot is controlled by our virtual lock system which is equipped with a high quality durable key-pad lock that has Internet access. 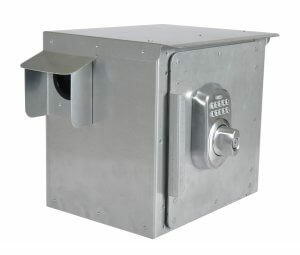 Manufactured out of 18ga G90 galvanized steel. If a customer is coming early or late to pick up or drop off a product, you can generate a code for them to give them access 24/7. No longer do you have to have employees work late or get there early to meet a customer. DropSpot lets you extend your pick up and drop off hours around the clock. Set your code to work daily, weekly, or monthly. We carry different sizes to meet customer needs. 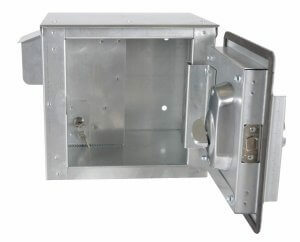 Another version we have is our KeyDrop system. 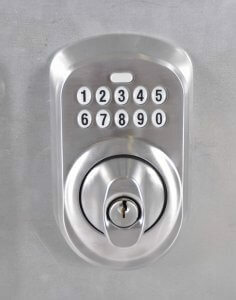 Customers drop their keys in the side slot, which collects the keys in an internal lock box. The main container can still be used as a Drop Spot to deliver keys or other items to customers. Watch the video below to see how the virtual lock works.